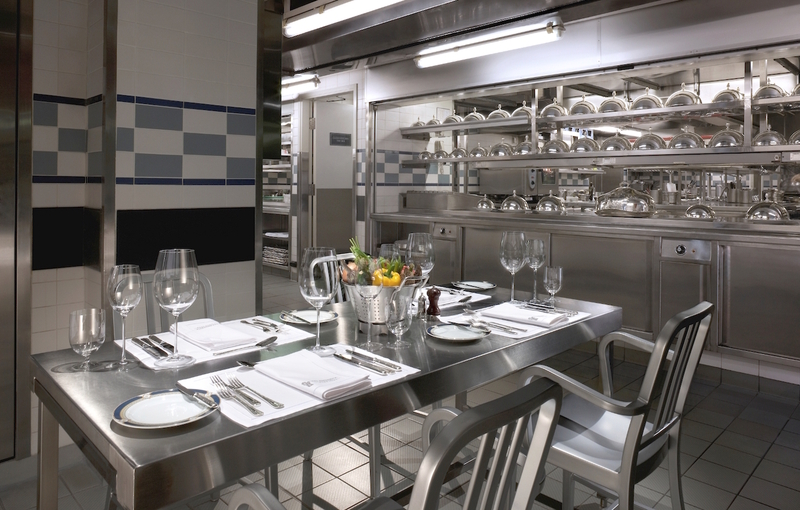 Fans of Gordon Ramsay’s Kitchen Nightmares may be equal parts relieved and disappointed to see quite how refined The Peninsula’s kitchens are; immaculate stainless steel surfaces abound, with dozens of silver cloches so shiny you can see your face in them, and there’s no one screeching, “IT’S F*CKING RAW!” at any stressed-looking minions. If you’ve got a sweet tooth as raging as mine, you must check out the patisserie and bakery sections – watching these intricate, beautiful desserts get plated is a soothing art-form all of itself, whilst the intoxicating smell of The Peninsula’s freshly baked scones deserves to be bottled as a fragrance. All of this would be worthless if the food at Chef’s Table itself wasn’t any good… but in the biggest non-cliff hanger of the year, of course, every dish is pretty amazing. Gaddi’s recently welcomed a new chef, Xavier Boyer, to its helm and he has given the place a culinary shot up the arm; whilst the food at Gaddi’s was always delicious, he’s modernised the flavours and presentation to do justice to the restaurant’s classic French cooking, and the results are all kinds of magnifiqué. 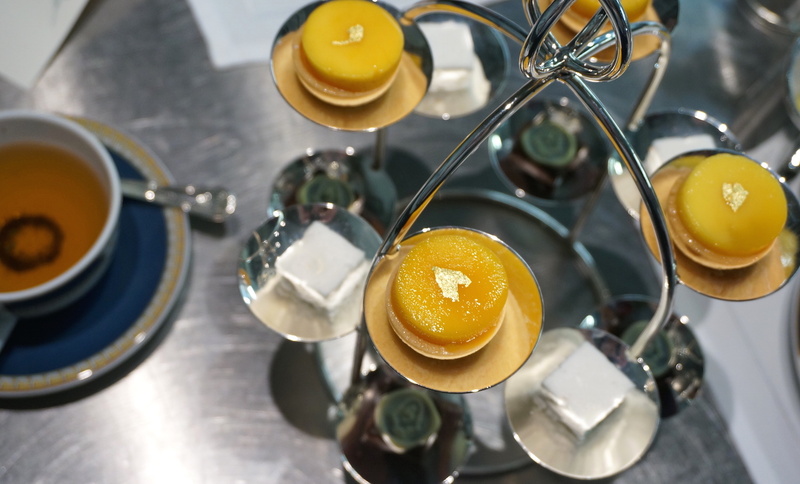 This is evident right from our amuse bouche: a trio of delicate mini morsels so special, it appears to have had a plate designed especially to serve it on. 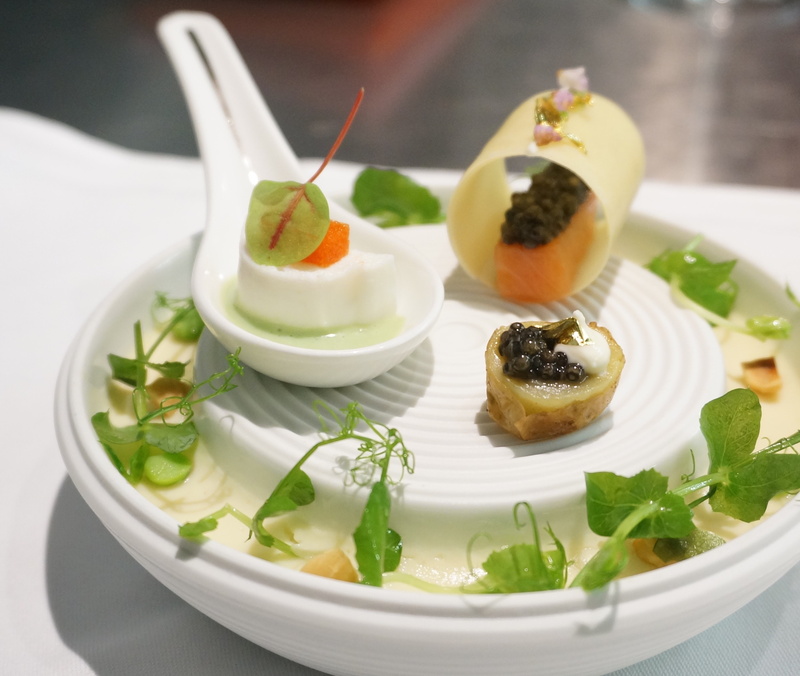 There’s a silky-smooth squid mousse topped with bell pepper jelly and a parsley cream sauce; a teeny-tiny potato with caviar and sour cream; and possibly my favourite, the world’s thinnest tuile wrapped around some caviar-topped salmon, a one-bite wonder that packs a more powerful umami punch than dishes twice its size. Piped around the side is the creamiest, smoothest, most flavoursome oniony potato purée – the kind of thing you’d imagine particularly discerning gods eating in Elysium – studded with inspired sweet bursts of peas and crunchy chunks of hazelnut. 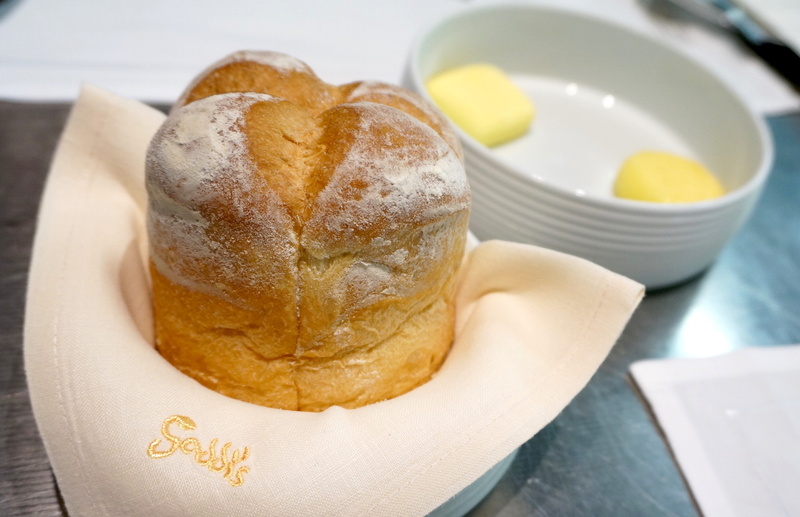 Nevertheless, you’ll have a hard time deciding whether to focus your attentions on the amuse bouche or Gaddi’s bread, which is warm, light, fluffy and drunk on butter. The best kind of drunk in my opinion! 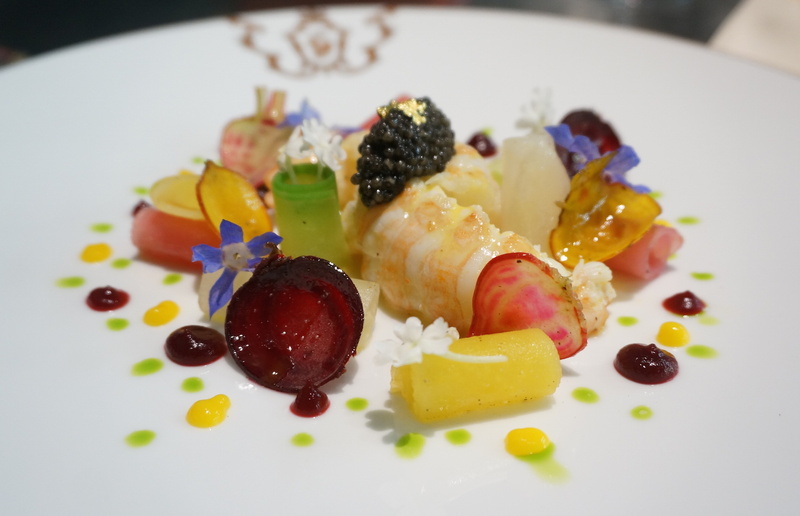 The appetiser is undoubtedly one of the best dishes I ate last year – Scottish langoustine salad with beetroots and French imperial caviar. It arrives looking like summer on a plate, except my summers are usually sticky, sweaty and uncomfortable whereas this just looks colourful, beautiful and delicious. 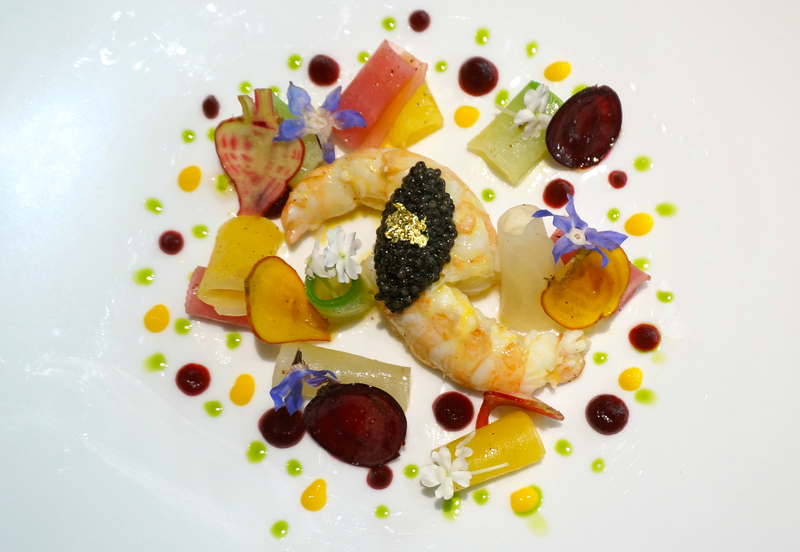 Every bite is a sensation; the langoustine is sweet, tender and cooked to just-done perfection; the caviar adds precise joyous pops of salty intensity with each mouthful. The enticing riot of vegetables and sauces – prepared so skilfully I break into a sweat just thinking about how you cut beetroots that finely – bring a fresh, humble earthiness that rounds off the whole dish. I ate this in June 2016 and I imagine I’ll still be thinking about it in June 2017. Sublime. 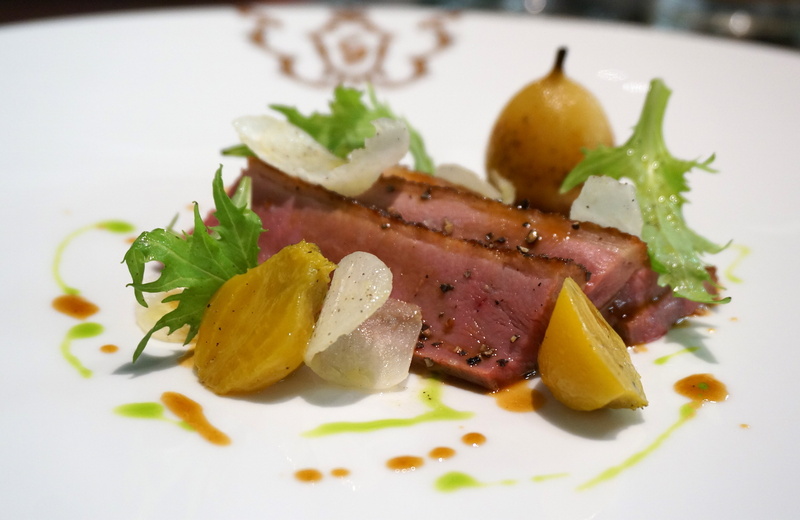 After that showstopper, it’s unsurprising that our main of pan-fried duck breast with spice-poached pear, baby beetroots and radish feels a little anticlimactic. The meat is strangely lacking in that ultra distinctive duck flavour (it tastes mostly of black pepper) and it’s a tad chewy for my liking too. The highlight of the dish is actually the adorable tiny poached pear (hands up who knew that pears could be adorable? ), which is headily spiced and enlivens the duck considerably. Things move into focus again for dessert though, and how so – 2017 Rach can definitively tell 2016 Rach that this was easily one of the best dishes she ate that year too. 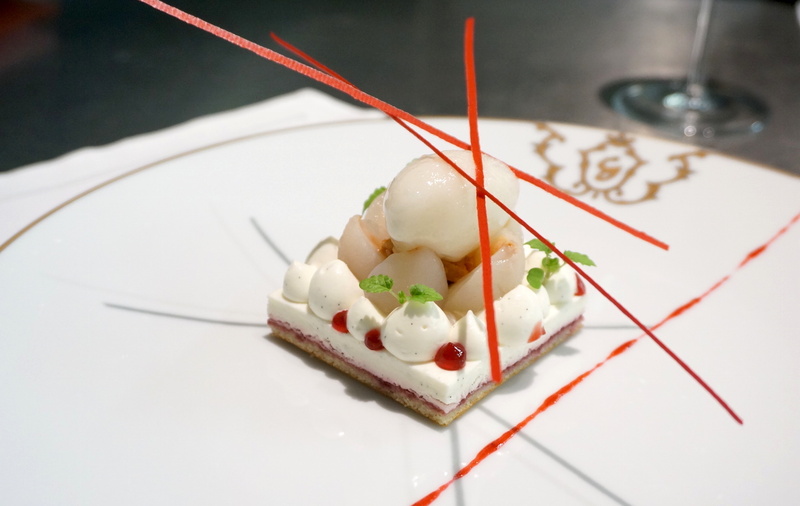 It’s a vanilla-bourbon mousse with fresh lychee, raspberry jam and lychee sorbet and it sits atop one of the most beautiful, delicate squares of short pastry I have ever had the pleasure of tasting. That sigh-worthy crack when you cut through a really great short pastry = one of the most thrilling sounds in the world, happily pregnant with the promise of an incredible dessert. The contrast of textures between that and the smooth ripples of mousse is just perfect; the gorgeous flavours of juicy sweet lychee, fizzing sorbet, tangy raspberry, creamy vanilla, buttery pastry… it’s just a tender symphony of dessert delight. Lychees are only in season for such a short period of time, and I can think of no better tribute to their loveliness than this dessert. 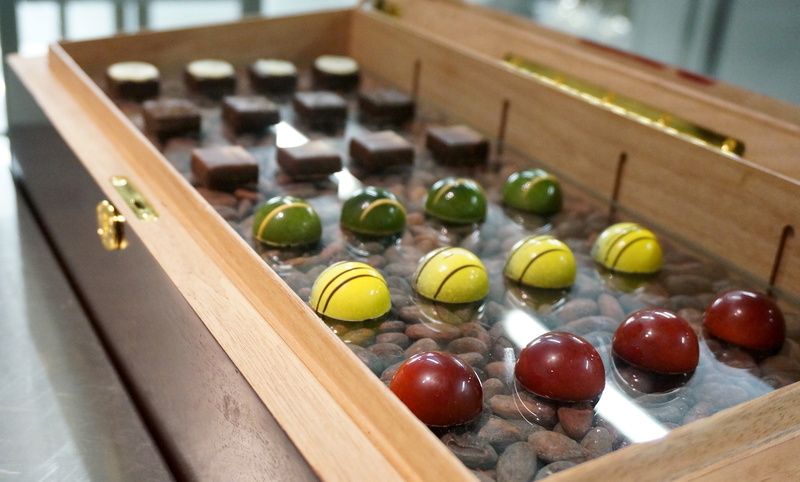 After that, I have to confess to barely noticing the petit fours (mango tarts, raspberry chocolates and mini marshmallows, since you ask) but crazed chocoholic that I am, I perk up as soon as Gaddi’s box of artisanal chocolates is wafted in front of me. You get to pick your own flavours from the daily selection, so of course, I try them all. The raspberry chocolate – Gaddi’s signature – is excellent, the perfect marriage between rich dark chocolate and bright tart berry; I also loved the Earl Grey, a grown-up, elegant creation infused with just the right amount of sophisticated tea flavour. There’s also honey… and passion fruit… and coffee… and vanilla… all decadent little planets that will spin any chocolate fiend into their happiest of happy places. The bad news is that you might never see some of these dishes again; the whole point of Gaddi’s Chef’s Table is that it is a highly seasonal, magical mystery tour of Chef Boyer’s command. The good news? Based on this meal, I can only guess at how incredible the rest of his repertoire is… and feel some serious pangs of jealousy at the beautiful and delicious surprises you’ll be served that I’ll never get the chance to try either! The Chef’s Table at Gaddi’s is currently priced at $828 per person for a three-course lunch, $2088 for a five-course dinner and $2688 for a ten-course degustation; given it’s the kind of place where special occasions get even more special, I reckon it’s worth it for a top-quality, totally personalised dining experience that’s quite unique in Hong Kong (and there’s always Gaddi’s restaurant itself if you want to try Chef Boyer’s food at a la carte prices). Let’s hope 2017 has a meal – or even two dishes – as stunning as this one in-store for me! This entry was posted in Food, Hong Kong and tagged best chef's tables in Hong Kong, best dining experiences Hong Kong, best restaurants in Hong Kong, best restaurants in Tsim Sha Tsui, best tasting menu Hong Kong, Chef's Table Peninsula Hong Kong, fine dining Hong Kong, French cuisine, French cuisine Hong Kong, Gaddi's, Gaddi's Chef's Table Hong Kong, Gaddi's Hong Kong, modern French, modern French cuisine Hong Kong, Peninsula Hong Kong, special occasion dining Hong Kong, Tsim Sha Tsui, where to eat in Kowloon, where to eat in Tsim Sha Tsui, Xavier Boyer. Bookmark the permalink. No wonder, Chef Boyer worked with multiple Michelin star restaurants before. Sounds like a good choice for a special event! This sounds amazing, we are going for lunch in December this year at the chef’s table, was your’s the dinner experience? How exciting! Actually, I went at lunchtime (better lighting! 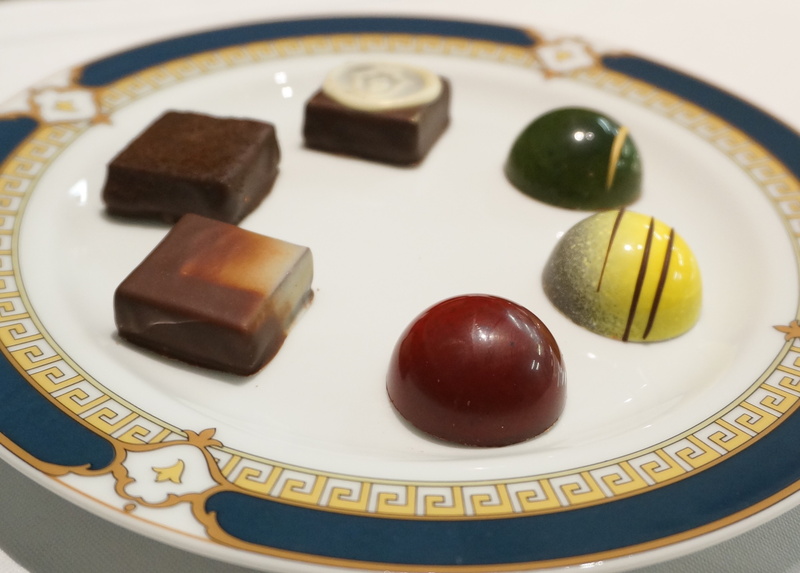 ); the menu was basically three-course, plus the amuse-bouche and petit-fours – although I’m not sure if the chocolates are usually included for lunch service? I’m sure you’ll have a lovely meal either way – let me know how it goes!